I hope you have enjoyed our long walk through the book of Genesis – almost as long as Abraham’s and Jacob’s wanderings! – and our study of the women who people this great story of Israel’s history from Creation to Egypt. Today, we’re going to be wrapping up by looking at some of the broader themes and topics in Genesis. You may want to look back over your notes, or previous lessons, all of which are linked above. Our next study will be a topical study of the Scriptures dealing with biblical womanhood. We’ll be having another fun title pic contest prior to the start of the study. I’ll have the exact title of the study and all the other details here for you next Wednesday (September 5), so get those creative juices flowing and pass the word to any artsy friends who might be interested! 1. What is the overall theme or purpose of the book of Genesis? Which attribute(s) of God does Genesis point to? 2. Make a list of each of the women we studied in this book. In what way did each of them contribute to moving the theme or purpose of Genesis forward? 3. What are some godly attributes of the women we studied that you aspire to in your walk with the Lord? 4. What are some ungodly attributes of the women we studied that God showed you were present in your own life? What are some ways you can mortify those sins and avoid those ungodly attitudes and actions in the future? 5. Which “Woman of Genesis” did you learn the most from, and why? 6. List three attributes of God that you learned about in this study. 7. What are the three major covenants in Genesis? Explain how each of them affected the person (and his family) it was given to and how each covenant points ahead to Christ. 8. All of the action in Genesis took place before God gave the Law (in Exodus, Leviticus, etc.). What are some specific incidents in Genesis that demonstrate that God’s moral law is transcendent (i.e. that the rules of morality – intrinsically good and bad behavior/attitudes – are universal. They applied before God gave Israel the Law and still apply now that Christ has fulfilled the Law – to everyone, everywhere.)? 9. What are the major historical events of Genesis? 10. What did you learn from this study about ancient Middle Eastern cultural practices, especially those that impacted the life of women? 11. In what ways is the book of Genesis an introduction and background to the book of Exodus? Thanks again for studying The Women of Genesis. I hope it was as much of a blessing to you as it was to me! For more studies and resources on how to study the Bible for yourself, please click the “Bible Studies” tab at the top of this page. 1. Briefly review previous lessons (links above) to refresh your memory on the background of today’s passage. What events led up to the action in chapters 46-47? 3. Compare 46:3 to Genesis 12:2. How is this a promise to Israel of fulfillment of the Abrahamic Covenant? How can this passage be a reminder to us that God does not forget His promises and that He has a right to carry out those promises in any way and any timing He chooses, even if it doesn’t make sense to us? What does this teach us about God’s sovereignty, His authority, and His infinite wisdom, compared to our humility and limited knowledge? 4. Why would it have been important to the nation of Israel’s history and record-keeping to list the names, numbers, and relationships (46:8-27) of the people who left Canaan to settle in Egypt? 5. Consider 47:5-6 and recall 45:16-20. Why was Pharaoh, a pagan, so favorably disposed toward Joseph, and consequently, Joseph’s family? What character traits had Joseph displayed while serving Pharaoh that had such an impact on him? Think about the way you serve your employer, your family, and your church. How does the Fruit of the Spirit you display impact your relationships with those you serve? 6. Compare 47:11-2 with these passages. How does Joseph’s provision for his family who has come to him paint a picture of God taking care of the needs of those who come to Him? 7. Consider 47:13-26 with regard to Egypt’s rise to power in the ancient world. What did Pharaoh take from the people first? (47:14-15) Next? (47:16-17) Next? (47:18-21) How did this shift the balance of power between the people and the Egyptian government? Was it God’s will for Egypt to become a powerful and prominent nation? Who sent the famine that set these wheels in motion and who could have stopped it? Thinking ahead to the Exodus, what was the significance of having an “almighty” Pharaoh and empire as the backdrop for Almighty God’s signs, wonders and deliverance? 8. Think about 47:23,35 in light of these passages. How does Joseph purchasing the people to save their lives point to Christ’s redemption of sinful man? Was there any way for the people to save themselves? How did Joseph show mercy and compassion to them? What was the people’s response to becoming servants? Were they resentful? Grateful? What does this teach us about why we should serve Christ, and the attitude with which we should serve Christ? Again compare 46:3 to Genesis 12:2, and consider 46:1-4, this time putting yourself in Israel’s shoes. God has promised Canaan to Abraham’s descendants. Israel already lives there with a decent number of descendants. (46:8-27) From Israel’s human vantage point, does it make sense for him to pack everybody up and leave the Promised Land (46:5-7) rather than staying, increasing in number, and taking over Canaan? But can Israel see the big picture, centuries into the future, the way God does? Think about a time God worked in your life in a way that, humanly speaking, didn’t make sense. Compare your finite knowledge of the situation with God’s infinite knowledge of it and His “big picture” plans. Considering this, write down three reasons it is important to trust God and three reasons it is important to obey God, especially when things don’t make sense. 1. Genesis 44:1 begins with the word “then.” What happened prior to the action in chapter 44? Briefly review recent lessons (links above) to refresh your memory on the background for today’s lesson. 2. Review question 5 from Lesson 32. How much time might have passed between the brothers’ first trip to Egypt (and Joseph’s rough treatment of them) in Genesis 42 and their second trip to Egypt (and Joseph’s rough treatment of them) in Genesis 44? It’s important to keep in mind that the events of these two chapters did not occur back to back in real time. 4. What did Judah’s plea in 44:18-34 reveal to Joseph about his brothers’ regard for their father and for Benjamin? What was Judah willing to do (44:33) out of concern for them? Considering the reasons (from question 3) Joseph may have treated his brothers roughly, what response did this treatment draw out of Judah and the other brothers (44:12-17)? 5. What finally convinced Joseph it was time to reveal his identity to his brothers? (45:1-4) Compare 45:3 with 44:30-34. Why would Joseph ask if his father were still alive? 7. Compare 45:5 and 45:7. Distinguish between these two purposes for which God sent Joseph to Egypt. Notice the word “you” in verse 7. To whom does “you” refer? What were the implications for the future of Israel of God preserving a remnant of survivors of Joseph’s brothers? 8. What can we learn about repentance and forgiveness from today’s passage? In 45:5, is Joseph brushing aside his brothers’ sin? 9. Write about joy as it is portrayed in chapter 45. What is the source of joy? How is it expressed, and to/between whom? 10. Compare 45:5 to Isaiah 53:10. How does God sending Joseph – via the route of suffering – to save people point us ahead to Christ? Did Joseph’s hard work and suffering save everyone affected by the famine, or only those who came to him seeking the “bread of life”? What did you learn from 44:9 about the imprudence of speaking rashly when you don’t know all the facts of the situation? What does the Bible teach about speaking or vowing rashly? Consider these passages, noticing how some of them are worded in the positive (“do this”) and some are worded in the negative (“don’t do that”). Make a two column chart listing all of the positive statements in these passages in one column. In the second column, accurately re-word this statement in the negative. For example: Part of James 1:19 says “be quick to hear”. You might re-word this as “don’t be someone who doesn’t listen to others”.) Make a second chart for the negative statements in these passages, rewording them into positive statements. Apply these concepts to a current or past situation you’ve been in. In what ways were you obedient to these biblical instructions? Are there any you were disobedient to and need to repent of? And now do not be distressed or angry with yourselves because you sold me here, for God sent me before you to preserve life. 1. Imagine you are writing the setting for the first act of a play that begins with the action in chapter 42. Reviewing previous lessons (links above) if necessary, how would you briefly set the scene? 2. By which name does this passage call Jacob in 42:1? In 42:5? Why do you think it switches back and forth? 3. Examine the extent of the famine (42:5) on an Old Testament map. How widespread was it? 6. How is the gospel reflected in Israel – the father – sending (43:13) his “only son” (42:38) to (what Israel thought would be) his death (42:36,43:14) in order to redeem (42:34,43:5,14) his captive (42:24) child who could do nothing to free himself? Think about Joseph’s position and power compared to the lack of position and power of Simeon and the other brothers. What ultimately won Simeon’s redemption – his own abilities, the money his brothers brought, the present they brought, or bringing Benjamin? Even after all of those efforts to earn Simeon’s freedom, didn’t Joseph still have the power to kill or imprison any or all of his brothers if he wanted to? Was Simeon’s redemption earned by any human effort or was it by Joseph showing mercy and extending grace? How is this a picture of our salvation being completely dependent on the mercy and grace of God? Write down three Bible verses that explain how salvation is by God’s grace and mercy, not by our human effort of good works to earn salvation. May God Almighty grant you mercy before the man, and may he send back your other brother and Benjamin. And as for me, if I am bereaved of my children, I am bereaved. 1. Reviewing previous lessons (links above) if necessary, briefly summarize Joseph’s life and experiences up to this point. What was happening to Joseph when last we left him? 2. What’s the first thing you think of when you think of Joseph? His “coat of many colors” and his status as favorite son? That God enabled him to interpret dreams? His fame and success as Pharaoh’s right hand man during Egypt’s famine? Joseph was favored and successful at many points in his life, but he also suffered greatly. From previous lessons and from today’s passage, describe the various ways Joseph has suffered in his life. How do Joseph’s sufferings and successes point us ahead to Christ as both Suffering Servant and King of Kings? How does Joseph’s being lifted up out of “the heart of the earth” (the “pit” 40:15, 41:14) foreshadow Christ’s resurrection? 3. Since God is sovereign and in complete control of everything that happens, why didn’t He remind the cupbearer to speak up on Joseph’s behalf as soon as he got out of prison? (40:14-15, 23, 41:1, 9-13) Why didn’t He cause Pharaoh to have his dream sooner? (41:1) Why did God wait two whole years, allowing Joseph’s suffering to continue? 4. How did Joseph give glory to God for his abilities and witness to Pharaoh about the one true God? (41:15-16, 25,28,32,38-39). List some ways you can use your God-given talents and abilities to honor Him, to bring glory to Him, and to testify to others about Him. Why is it important for Christians, like Joseph, to have a good work ethic? 5. List the godly character traits exhibited by Joseph in this passage. Which Bible passages talk about these traits? Are any of these traits lacking in your life? Which of these traits do you think you are most spiritually mature in? 6. What can we learn about the nature and character of God from this passage? Which of His attributes are showcased? What can we learn about how God governs the affairs of men and works in the hearts of men? 7. Since this is a descriptive passage (a narrative report of what happened) rather than a prescriptive passage (instructions or commands), what can we not learn from this passage? For example: Does the fact that God spoke to three people through dreams in this passage mean that we should expect Him to speak to us through dreams today? Does the fact that Joseph became successful and powerful guarantee that God will make you successful and powerful? List several things we can not learn from this passage along with the correctly handled Scriptures that would apply. Have you ever been in a “two more years in prison” situation like Joseph was in which you went through prolonged suffering, injustice, or feeling abandoned? Why did God allow you to suffer? What does the Bible say about suffering? Looking back on your situation, what are some good things God brought out of it? How did He grow you spiritually during that time? Set aside some prayer time to thank God for bringing you through that suffering and for what He taught you and how He grew you during suffering. Ask God to give you the opportunity to comfort someone who’s suffering the way He comforted you. 1. Briefly review lesson 28 (link above) to refresh your memory on the storyline of Joseph, then read today’s passage. Why do you think Joseph’s story starts in chapter 37, is “interrupted” by the story about Judah, his sons, and Tamar in chapter 38, and then picks back up in chapter 39? 2. How did Potiphar (1) come to acquire Joseph? 3. Carefully examine the description of Potiphar in verses 1-2 and Potiphar’s house, status, and living conditions in verses 1-6. Make a list of the things we can infer about “Mrs. Potiphar” from this information- where and how she lived, her social status, socioeconomic level, etc. Was it likely that Mrs. Potiphar was a Believer in the one true God? 4. Read verses 6-19, closely examining Mrs. Potiphar’s words and actions. Write a character sketch of Mrs. Potiphar, adding in the information from your list from question 3. What adjectives would you use to describe Mrs. Potiphar? 5. Describe Mrs. Potiphar’s outward sins. Outward sin can always be traced back to an inward sinful thought or attitude of heart. What was Mrs. Potiphar’s inward sin? How is lust a form of coveting? When a person covets or lusts after something or someone that doesn’t belong to her, what does that tell us about her attitude toward what she already has and the God who blessed her with those things? 6. The New Testament equates coveting with idolatry. Why? 7. Imagine you are a biblical counselor, and a modern day, recently born again Mrs. Potiphar comes to you for help with her struggle against lust and coveting. Considering questions 5 and 6, what sinful heart attitude would you help her to identify as the cause of her lust and coveting? In previous lessons, we have explored the biblical model of repentance: putting off the old self (stop doing the sin), renewing your mind (learn what the Bible says about this sin), and putting on the new self (replacing sinful actions with godly actions). How could you apply these passages, using the put off/renew/put on model, to Mrs. Potiphar’s root sin of discontentment? How could thankfulness to God and serving others be the godly opposite of coveting and lust? 8. In what ways was Joseph’s righteous behavior a testimony to the one true God? How could 2 Timothy 3:12-13 apply to his situation in this chapter? Does God guarantee us that things will always go smoothly if we’re obedient to Him? If not, why should we obey Him? Do you struggle against the sin of a discontent heart like Mrs. Potiphar did, causing you to lust for and covet things, people, or life circumstances that God has not chosen to give you? Examine and repent of your sin using the put off/renew/put on model. List one Bible verse to memorize that will help you with the “renew” stage. List three specific godly actions you can do (put on) to replace sinful actions (put off). This week, memorize your verse and carry your list with you to remind you of the godly action you can take when you’re tempted to sin. Pray daily, asking God to strengthen you to resist temptation and obey Him. But the Lord was with Joseph and showed him steadfast love and gave him favor in the sight of the keeper of the prison. 1. Who was Judah? (1) What do we know about him thus far? What do we know about his connection to Jesus? 2. What nationality was Judah’s wife (Shua’s daughter)? (2) Review previous lessons (links above) dealing with Abraham’s offspring taking Canaanite wives. What were some of the reasons it was problematic and undesirable for those in the Abrahamic Covenant to intermarry with the Canaanites? 3. What was Judah’s wife’s name? (2,12) How many sons did she have, and what were their names? 5. Verse 8 is the first instance we see in the Bible of levirate marriage. God later codified this practice into Israel’s law. What was the purpose of levirate marriage? How did it protect both the widow and the posterity of the family line? Put yourself in the sandals of an Old Testament woman involved in a levirate marriage situation. Describe some of the circumstances you might face, and the thoughts and emotions you might experience. 6. What happened with Tamar’s second husband? Explain verses 9-10 in your own words. What was Onan’s sin? Was it sexual sin or something else? (9) What does Onan’s sin tell us about his character as a man and as a husband? 7. Describe Tamar’s husbands and her experience with marriage thus far as she might describe it. Think back over Rachel’s, Leah’s, and Sarah’s desperation to have children as a reflection of the pressure that culture put on women to prove their worth and value through bearing sons. Could Tamar have been feeling that same sort of desperation, especially since she had gone through the “right channels” (levirate marriage) and had been cheated out of her legal recourse? 8. Explain in your own words the situation with Tamar marrying Shelah, Judah’s third, and only living son. (11, 14b, 26) Had Tamar followed Judah’s instructions? Had Judah kept his word to her? Briefly explain how Tamar had been let down by Er, Onan, and now Judah. 9. Read verses 13-26. What was Tamar’s plan? Was it premeditated? In what way(s) did Tamar sin in this situation? Did Tamar’s desperation and hopelessness over her situation and her mistreatment by Judah and his sons justify her sin? 10. Make a list of Judah’s sins against Tamar and against God, including any Scripture references you can recall of biblical principles he violated. Consider how Judah’s hypocrisy and judgment of Tamar in verses 24-26 is an example of the unbiblical judgment and hypocrisy Matthew 7:1-5 talks about. Describe how Judah could have treated Tamar in a godly way. 11. Did Judah’s sins against Tamar justify her own sin? If someone sins against you, is it OK with God if you act sinfully in response? How did Jesus act when He was sinned against by the Pharisees, Judas, and others? How can we follow His example, and why is it important for Christians to respond in a godly way to ungodly people and situations? 12. Compare and contrast Tamar’s mistreatment at the hands of men, and her response to the situation, with the current clamor in evangelicalism to respond to misogyny (both real and perceived) in the church. How does Tamar’s story teach us the importance of responding to misogyny and abuse in a godly and biblical way rather than taking matters into our own hands and doing what seems right in our own eyes? Then Judah identified them and said, “She is more righteous than I, since I did not give her to my son Shelah.” And he did not know her again. 1. 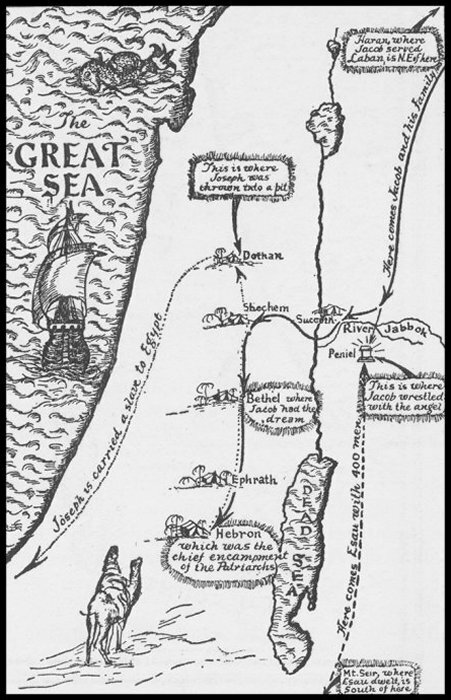 Study a map of Jacob’s travels, locating Haran, Shechem, and Bethel (35:1). What happened in Jacob’s life at each of these three places (review previous lessons if necessary)? 2. Where (city and nation) was Jacob living when God told him to move to Bethel? In what major way had living in the Shechemite area of Canaan influenced Jacob’s family? (35:2-4) In the book of Exodus, when we see Israel journeying through and into the Promised Land, what is the main offense against God that the Canaanites are guilty of? How did their idolatry impact God’s people? 4. Regarding the sin of idolatry, what were the three steps (35:2-3) of repentance Jacob led his family in? How can these steps be a model of repentance for us today? 5. Compare Genesis 28:10-22 with 35:1-15. Why did God tell Jacob to go back to Bethel (35:1)? What are the similarities and differences between the two passages with regard to God’s and Jacob’s words and actions? What promises did God make to Jacob in each passage? Describe the worship that took place in both passages. 6. Who was Deborah (35:8), and about how long had she been with the family? In what ways was Deborah’s death honored and memorialized (using your footnotes, what does Allon-bacuth mean)? Considering that we rarely ever hear the names of servants, much less the memorializing of their deaths, what might we surmise about Deborah, her character, and her relationship with Isaac and Rebekah’s family and Jacob’s family? How can you have an impact for Christ on others by serving them? 7. Refer again to the map in question 1. Where did Jacob travel in 35:16-27? 8. Examine 35:16-26 and review our previous lessons about Rachel. If you were writing Rachel’s obituary, how would you describe her? If Jacob were giving the eulogy at her funeral, what might he say about her? Why do we hear about Deborah’s, Rachel’s, and Isaac’s deaths, but we don’t hear about Leah’s or Rebekah’s deaths? 9. Compare Genesis 30:22-24 with 35:16-26. How was Rachel’s prayer answered? Using your footnotes, what do Ben-oni and Benjamin mean, respectively? Why do you think Jacob changed the baby’s name? 10. Who wrote the book of Genesis? Who was the original audience of the book of Genesis? Why might God have considered the information in chapter 36 important for this audience to know? How is this chapter a fulfillment of prophecy? Jacob’s family was influenced toward idol worship by the Canaanites they lived among (35:2-4). Think about the various environments you live in: your community or neighborhood, your church, family, friends, workplace, clubs or organizations, social media, etc. Do any of these environments influence you toward idolatry – putting something in God’s place in your affections, loyalties, priorities, and time? Idolatry is a sin that should be repented of and forsaken. Read my article The Christian Introvert: Putting Off Social Anxiety, Putting On Serving Others to learn about the process of putting off sin, renewing your mind, and putting on godly behavior. Thinking about your own idolatry, write down how you can “put away those foreign gods” (put off), “purify yourself and change your garments” (renew your mind) and “arise and go up to Bethel…and make an altar to God” (put on). Then let us arise and go up to Bethel, so that I may make there an altar to the God who answers me in the day of my distress and has been with me wherever I have gone.